Shelt Gill is a mediaeval cruck cottage with dry stone walls. 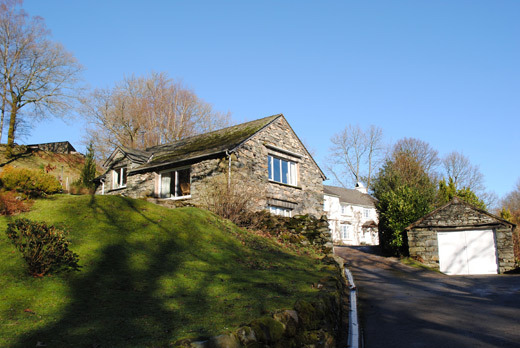 This family cottage in the Lake District has been modernised and extended to make a comfortable, fully equipped and attractive holiday home sleeping 4/5 in two downstairs bedrooms. On the first floor there is a spacious lounge / dining room with ancient timbers and a view over Lake Coniston. It nestles in the foothills of the Old Man/Walna Scar Range and is secluded without being isolated. Weekly rental varies with the season ranging from £390 to £640. We hope the menu links on the left will answer most of your questions. If we can be of further assistance, please don't hesitate to contact us personally. Shelt Gill is now a no-smoking cottage.